Xenics’ ultra-compact XSW-640 is a versatile easy-to-integrate SWIR OEM module that consumes ultra-low power. Typical OEM applications include infrared imaging for man–portable and unmanned (airborne and land-based) vehicle payloads, night vision, border security, Search & Rescue (SAR) and more. The XSW-640 OEM module detects short wave infrared radiation between 0.9 and 1.7 μm with a wide dynamic range and wide operating temperature. 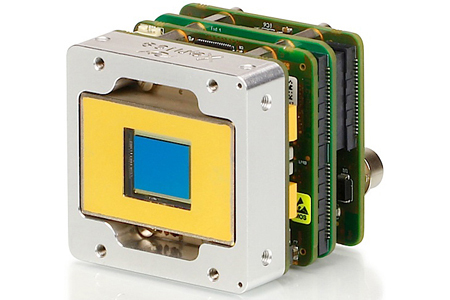 Thermo Electric (TE) cooling for reducing the dark current and noise levels and on-board image processing delivers best contrast and high image quality. Typical OEM applications for Xenics’ ultra-low power, ready-to-integrate, cooled, shortwave infrared (SWIR) module include infrared imaging for man-portable and unmanned (airborne and land-based) vehicle payloads, spectroscopy, process control, automated production inspection, machine vision, biometrics and more.